Today biomedical sciences are experiencing the importance of imaging biological parameters with luminescence methods. Studying 2D pH distribution with those methods allows building knowledge about complex cellular processes. Immobilizing pH sensitive nanoparticles inside hydrogel matrixes, in order to guarantee a proper SNR, could easily make stable and biocompatible 2D sensors. Inkjet printing is also well known as tool for printing images onto porous surfaces. Recently it has been used as a free-form fabrication method for building three-dimensional parts, and now is being explored as a way of printing electrical and optical devices. Inkjet printing was used either as a rapid prototyping method for custom biosensors. Sol-gel method is naturally bound with inkjet, because the picoliter-sized ink droplets evaporate quickly, thus allowing quick sol-gel transitions on the printed surface. In this work will be shown how to merge those technologies, in order to make a nanoparticles doped printable hydrogel, which could be used for making 2D/3D smart scaffolds able to monitor cell activities. 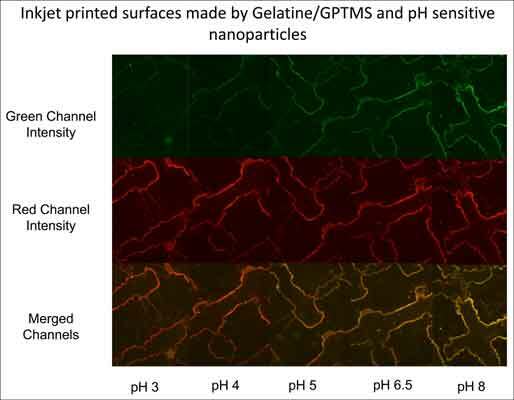 An automated image analysis system was developed in order to quickly have the pH measurements from pH nanosensors fluorescence images. Gelatine, Inkjet, Nanosensors, pH sensors, Silane, Sol-Gel. Largo Lucio Lazzarino 1, 56122, Pisa, Italy.